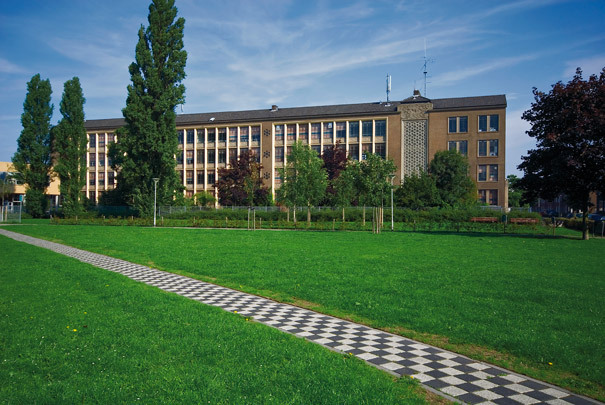 Municipal architect Leo Voskuyl chose a single tall volume for this secondary school, positioning it as close as possible to the edge of the square (Nachtegaalplein) which left a large space for public greenery and school gardens. The main building combines a wing of classrooms in the south with corridors along the north wall. A gymnastics block stands at an angle to it with an instruction pool on the ground floor. The sports section has its own entrance. Prefabricated concrete decorations, an entryway with a copper structure containing the school bell and gently pitched roofs complete the elegant design. The facade decoration depicts Pallas Athene, protectress of schools teaching the Classical languages, and was cast in situ using a plaster template.